KDDI announces new “LISMO Store” powered by Rekochoku to update the software and work with each, and enhanced backup features such as music more conveniently search and purchase music in the au smartphone will conduct. You can search for and purchase listen to “easy” access to music “LISMO Store” by simply tapping the “Store” icon that appears in the top-right corner of the screen LISMO Player, checking and anxious music Ranking Ichioshi . In addition, the music playback screen will display the (LISMO Store) artist page of music are you listening to now, you can audition and purchase new songs check-profile and popular songs. Purchase music you can enjoy immediately LISMO Player When the download is complete. You can purchase Music. 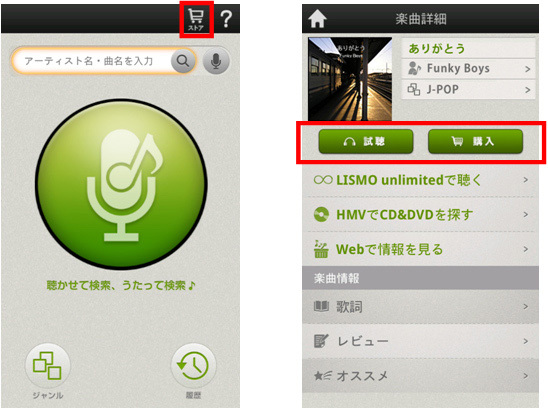 Are delivered in a “LISMO Store” by tapping the button “Buy”, “listen” in the song details the search screen. 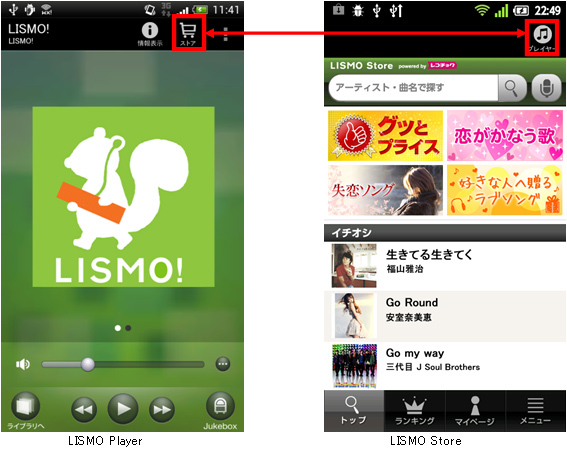 You can also check and re-download music from your purchase history can be accessed, “LISMO Store” just tap the “Store” icon to be displayed in the upper right corner of the top screen. Compatible mobile phone to transfer au LISMO, to au smartphone that you backed up the music and songs imported from CD, you can set the (internal memory or external memory) priority destination. Backing up multiple formats of music “Full Chaku-Uta ® full plus Chaku-Uta “” ® in addition to (. kdr), MPEG-4 (or. mp4. m4a) that are stored in the au smartphone support LISMO music that is protected by copyright, such as “” video clips “, 3GPP (.3 gp), MP3 (. mp3), WAVE can be backed up (. wav). Chaku-Uta to back up Chaku-Uta mobile phone, the phone numbers for the same corresponding LISMO can be transferred to au corresponding to the smartphone. Select the “EZ Content” on the left side of the screen. You can back up and press the button “Import everything from the cellular phone”.